Hi good people. First time posting on the Day boards, but long time daily follower here. I was actually surprised Card Hunter hasn't been brought to the attention of these boards yet. Though I'm sure at least some people here will be familiar with the game already, given the beta lasted quite some time. RPS and others mainstream outlets alike gave it quite some attention as of late. I'm sure a lot of Day fans will enjoy this game, as it features deep, strategical action and otherwise it's a pretty awesome game. It's f2p too! The game has been officially released little more than a month ago. In fact you might just go register and start playing the game for free now to see it for yourself. The game is great in teaching everything you need as you play anyways. 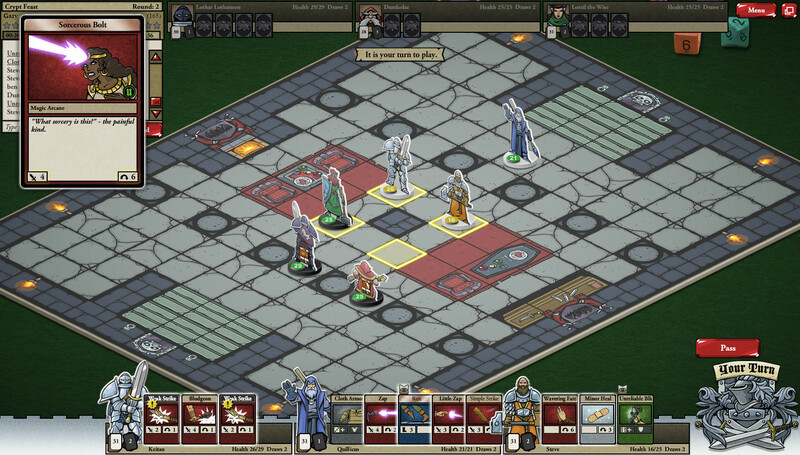 Part tabletop RPG, part turn based strategy game, part deck-builder, Card Hunter is Free-to-Play Browser game by the fine people at Blue Manchu. It's a brilliant mash-up which takes the best part of those genres, topping the whole thing with a vibe of old PnP games from the 80s for good measure. The team at Blue Manchu, all industry veterans with several AAA games under their belt, have been working on the game since 2011. These are guys who have worked at Irrational Games, Looking Glass, NCsoft and Trion Worlds, and who helped crafting games the like of Bioshock, System Shock, Thief, Freedom Force and Rift. Richard Garfield (creator of Magic: The Gathering, which you may have heard of) and Skaff Elias (Magic designer and founder of the Magic pro-tour) are also working on the game as consultants. 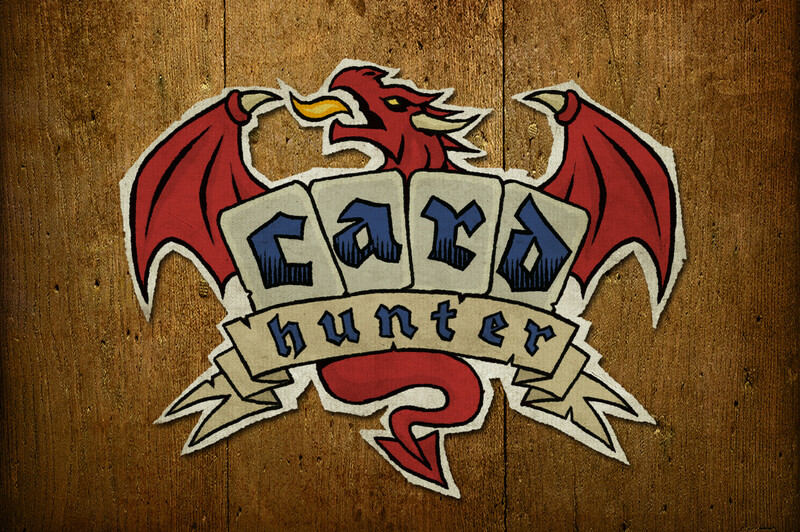 Card Hunter is a masterfully crafted product (I'm not exaggerating here). I don't think I've seen such an high-quality, high-polish game in recent years flash-based browser games in years (if ever), let alone f2p ones. Actually, if I didn't tell you right along and just put the game in front of you, chances are you could hardly tell what the game was running on. As you play the game, you soon realize how much care has been put into making sure the player would experience an enjoyable and compelling experience. 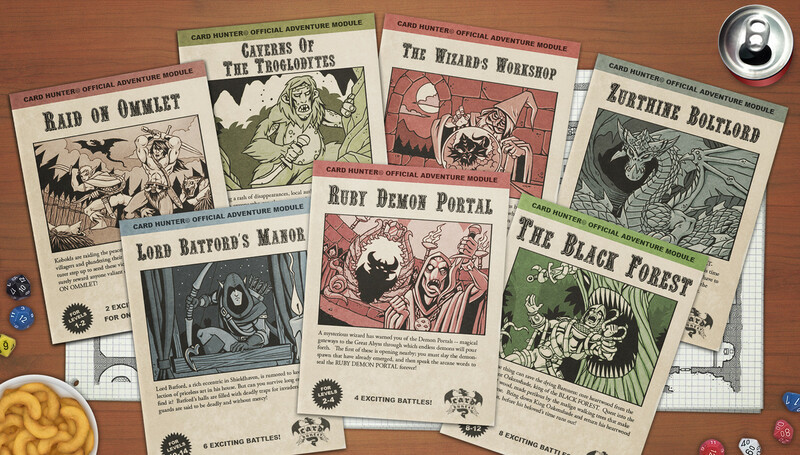 The art-direction, which nods to classic fantasy-illustrations for classic PnP games, is has its own unique style which feels both original and modern. The writing is also very mindfully thought out, tapping into memories of RPG players of old. If you played D&D back in the 80s-90s like me, this game will catch your imagination and recall you memories like nothing else. Oh. I should also mention the game is online-only. Your characters, items, progress and everything else is stored on the server. I'm pretty sure how this sort of things work. The flash client is the only one available atm (though some people on the forums succesfully experimented playing the game on a tablet by using third party software). Blue Manchu also stated they will eventually release an app for tablets at some point in the future (no smartphones, cause the experience kind of requires a larger screen). The game is still new and, although complete and fully playable in all of its parts, the developers are actively releasing patches and updates at a steady rate (typically a patch a week or so). These typically have to do with bug fixing, improving the code's efficiency and other assorted improvements. From time to time the game also gets new UI features and balance changes (though BM is very conservative when it comes to nerfing cards/items. They will still resort to nerfing without hesitation if need be). An expansion-proper is also expected at some point in the future, containing more classes, items, cards, Single Player adventures and what not. The player, you, controls a party of 3 adventurers and leads them on a quest for classic-fantasy adventures and epic loot, either through the Single Player's campaign or in fierce PvP arena battles. Any combination of race (Human, Elf, Dwarf) and class (Warrior, Priest, Wizard) is available for you to build the perfect party of heroes. 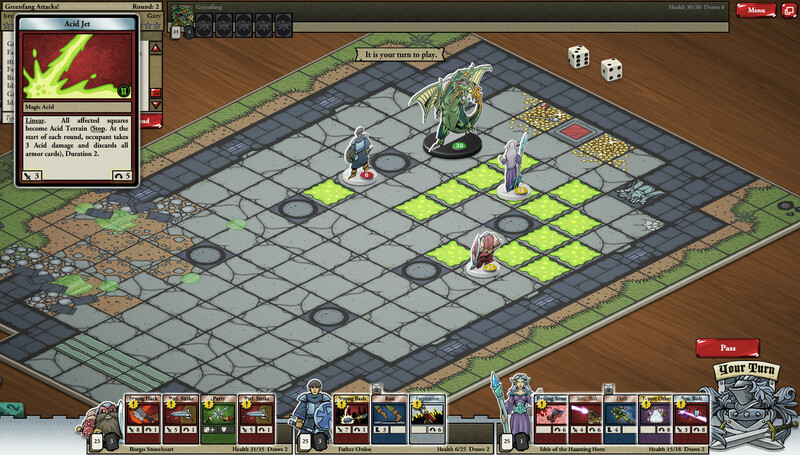 In Card Hunter, whatever ability you characters can use is represented by a card. A Wall of Fire to burn your enemies alive? You get a card for that. An Enchanted Armor helping your warrior soak up more damage? You get a card for that too. Yes, even moving your adventurer around the board requires you to play the appropriate card (I know this might sound awkward at first, but trust me, it just works wanders). In short, your adventurer is its deck, for all of its abilities come from the cards contained within. But deck-building in Card Hunter is quite different than what's going on in your typical TCG, as you don't pick cards to put in your deck one-by-one, but rather cards come attached to gear and items for you to equip your adventurers with. Broadly speaking, Weapons will carry Attack Cards with them, Defensive items comes with cards which boost your character's survivability, while class dependent items are grant access to unique abilities. The impact of this system is significant, and you can't just stock on really powerful cards. Maybe you really want to pick that powerful card on that shield, but it comes with other two cards you're not so sure about: You get all three cards, or you get none. This makes for great variety and lots of interesting choices to be made as you build your character's decks. This also means you will at times need to chose between an item coming with one or two very good cards on it (but which also has some other less-than-optimal, if not downright detrimental) and another which features only average cards but otherwise no cons. 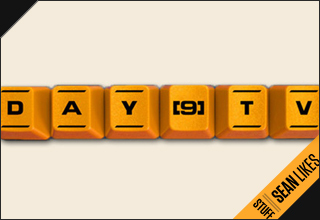 Loot obviously is a huge part of the game, and trust me, as you complete the Campaign's adventures or win Multiplayers matches, you will very quickly stock huge piles of assorted pieces of equipment. Gear comes in many different types of items (each fitting in the appropriate slot on the character's sheet)), power levels (ranging from 1 to 18) and rarity (from common to legendary). As you gather more and more loot, your deck-building options grow exponentially. 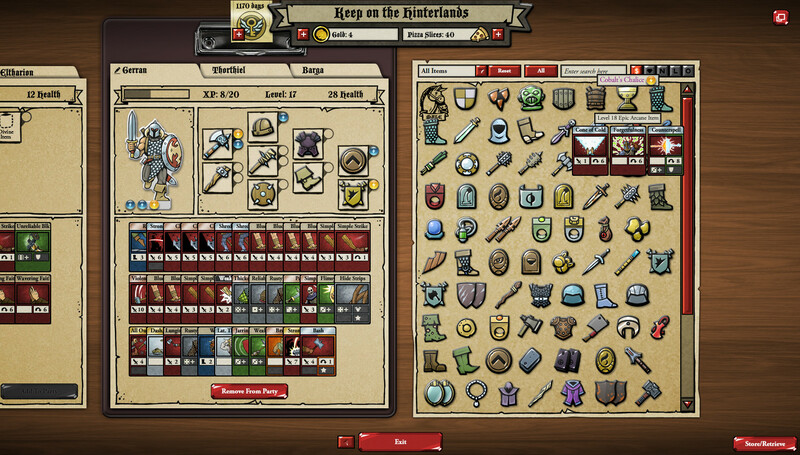 The game currently features roughly 1,500 different items, everyone of which featuring a combination (3 to 6, depending on the item's type) of the 500 cards available. You can imagine this game offers lots of possibilities in the way you might want to build your decks. The turn-to-turn action is very engaging. At the beginning of each round, each character draws 2 cards from its respective deck (monsters in the PvE also have their own decks). Each character also gets 1 free, additional movement card. Cards are played in turn, one by one, and the round goes on until each player's hand is depleted or both players pass the turn. Furthermore, you allowed to keep a maximum of 2 cards for the next round, meaning you will have to discard any excess at the end of the round. You do have to cope with whatever hand is handed out to you by the game, meaning a certain luck factor is in play. But making sure your chances of drawing a "playable" hand is also part of the deck-building part of the game. Striking for the right balance of Attack, Armor, Movement and Enhancement Cards is a key aspect of every efficient build. Luckily enough, the fact you're equipping items containing sets of cards rather than single cards makes the odds of ending up with an unplayable deck very much negligible. Anyways, the game system allows for true strategic choices to be made. As you get yourself accustomed with the complexity of the game and the wide array of possibilities, you do start developing strategies of their own, and you soon realize how flexible the game is in letting you pick the best items to support your overall strategy. Both selecting your party members and building their decks (in short, your build) have a huge role in determining how you're going to play any given game. You are indeed intended to take strengths and weaknesses of your build into consideration at any point in the game. Luckily enough, you are not required to start from scratch every time you wish to change your entire deck, as the game allows you to store/reload both party set-ups and equipment for later use. The Single Player Campaign is presented as series of modules, each representing an adventure which counts a number of battles for your party to complete, earning loot and unlocking more modules as a result. Each Module comes with some story attached to it, both at the start and end of the adventure, and in-between battles. These blurbs of flavor text is meant to both deliver the in-game lore and to offer useful hints about the kind of challenges you are to face. Modules offer a good variety in the kinds of themes and monsters presented. You get to defend villages from zombie horde, infiltrate a baron's mansion to deprive it of its legendary riches, defeat the threat of a group of intelligent-martial-primates, help a wizard shutting down demonic portals and much, much more. You will have to deal with a vast assortment of fantasy creatures, both classic ones like Lizard Men, Orcs and Spiders, Sentient Trees and more original ones the kind of bloodthirsty, Berserk Gnomes and Flying Monkeys. You are also presented with an overarching story concerning Gary (a Game Master in the making), his older brother Melvin (the rules-advocate kind of GM who would gladly kill the whole party in the name of following the rules to the latter), a pizza-delivery girl who Garry has a crush on, plus Garry's and Melvin's Mom who makes for some awkwardly fun moments. This narrative meta-story goes on parallel to your adventuring endeavors. It's very lighthearted and ultimately, often referencing nerddom and gamer's cliche alike, ultimately helping with breaking the otherwise monotony of classic-fantasy dungeon-delving and delivering quite a few funny moments. Lo and behold, you keep completing adventures, your adventurers gain experience and levels, lots and lots of loot is found along the way, and more adventures are unlocked. The SP Campaign features 40 adventure modules (each comprised of 2-to-5 single scenario battles). You're also given the the option to purchase 11 additional special adventures, called Treasure Hunts, making for a grand total of 51 modules. You get to open a normal treasure chest (containing loot in the form of gear or treasures) for each battle contained in a given module. In addition to that, the first time you complete an adventure only, you also get to open a special golden chest, which holds more goods and also grants better odds at dropping rare items. You can sell loot you don't need for gold at various NPC shops, which in turn can be spent to buy more items or to recruit new party members. You will also occasionally found treasures which cannot be equipped but otherwise are worth more than gear of equivalent rarity. The low level adventures are not that hard to complete, often being pretty much straightforward in the kind of monsters you're required to defeat. These first missions also serve to teach the game's basics to the player. As you complete more adventures and your party levels up, more item slots are unlocked (meaning your characters' decks also get larger), and the challenges you are to face also grow in difficulty accordingly. This is not a game which goes easy on its users. It does teach you all the tricks you need to learn in a very clear way, but it never holds your hand. And, while the first few missions can be won with relative ease, the game is expecting you to constantly rethink your strategy throughout the campaign. Different opponents come with a different set of abilities (i.e. cards), weaknesses and strengths, meaning a deck very effective in dealing with kobolds might be utterly useless for against imps and other caster-type of enemies. Because of that, you might very well end up having a hard time (or, simply put, losing) the first time you try out a new adventure. This doesn't mean you always have to restart the whole module if you happen to lose a battle, as you are offered three attempts (equivalent to lives, so to speak) and are given the option to pay some gold to continue if you deplete those. You are also able to tweak your adventurer's equipment in-between missions, meaning you can adjust your strategy in the case you jumped on an adventure and only found out your deck is ineffective in the middle of it. Some adventures are noticeably more challenging then others, so prepare for your skills to be tested, as you're up for some pretty rough battles if you're not careful in preparing your decks accordingly. Once you complete the game's campaign, you will unlock additional challenges (called quests). These are generally much harder to complete, as you are basically offered the option to replay any given module under a specific restriction (like winning without letting any of your adventurers die, starting a battle with 1hp only or completing the adventure on a specific party setup). You get 4 quests per adventure, meaning 400-some quests in total are there for you to tackle. Quests don't earn you any XP, but they do grant you a golden chest the first time you beat them. 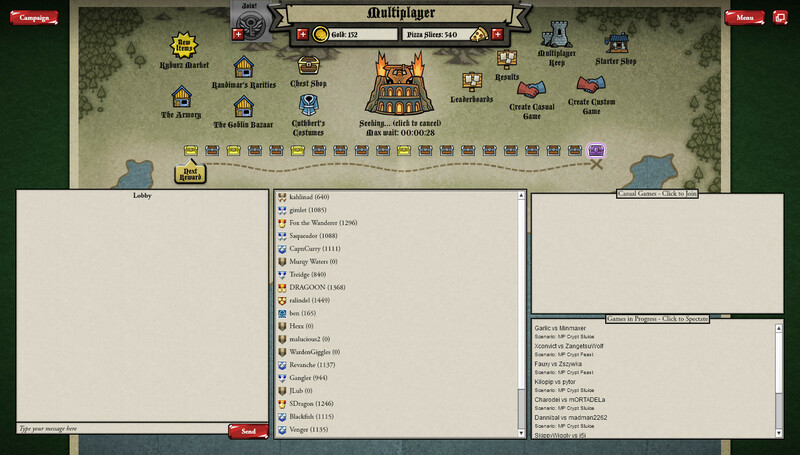 The game also features the option for you to play user-created scenarios. The in-game editor let's you create all kinds of maps for yours and other players' enjoyment. I haven't fiddled with this yet (too addicted to PvP atm :D ), but I'm told lots of great content is available already, and new user-authored maps are released daily. Blue Manchu recently hosted a map-making community contest. Every participant was awarded 100 Pizza Slices (the real money currency), while 300 and 1000 Slices where awarded to the finalists and the winner, respectively. 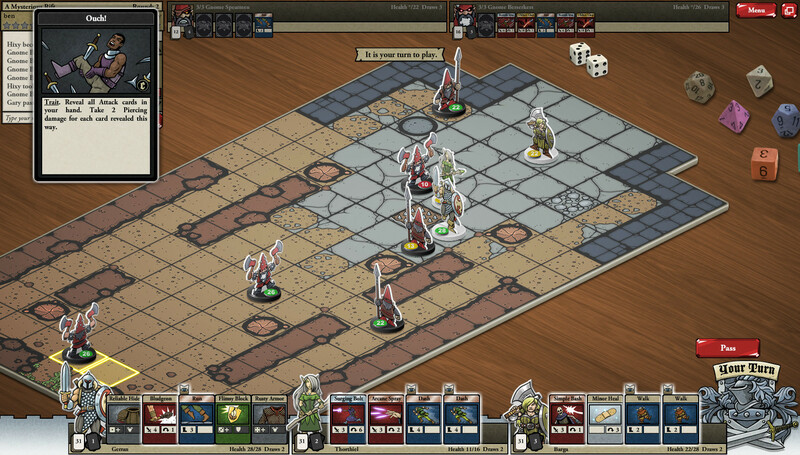 PvP in Card Hunter takes the form of Arena Battles where two players's parties are pitted against each other in a battle for glory and fortunes. Your SP and MP characters are actually the same ones, and you also get to use every item you found in SP. Similarely, whatever loot you get from the MP mode is available whn you switch back to the campaign. The only difference being, all of your characters are set to lvl 18 in MP, regardless of what their level is in campaign mode. This is to ensure players can compete on even ground (though, you're still bound to using whatever items you previously earned in either mode of play). You get introduced to MP pretty early in the campaign. Gary will explain the basics to you and also offer the option to get a MP Starter Party (basically a bundle of pre made characters coming with assorted equipment) for free from the Starter Shop. These are not extra fancy, but will be more than enough to get you started with what you need to start having fun in MP. While you might be tempted to start having fun in PvP matches right along, I will suggest you refrain from getting really serious about it until you complete the campaign, or at least get quite further into it. The campaign is great in teaching you how the game works, and you will also need some good equipment (which you inevitably find plenty of in SP mode) in order for you to compete at higher levels of play. The goal of an Arena match is to score 6 Victory Points before your opponent. Points are scored for killing the opponent player's characters (2 points per kill) and for holding more Victory Squares than the opposing team. At the end of each round, the player who has the more characters standing on the yellow-bordered tile (the Vicotry Squares) is earned 1 Victory Point. You enter a queue for joining a ranked match, and the Match-Making Algorithm will try and match you vs. a player of similar skill (the system does use an ELO-like skill-rating system, and each player has a rating score which goes up or down accordingly to matches results). This might take anywhere between a few seconds and several minutes (though the waiting time is brief most of the times), and you will ultimatelly pitted against an AI opponent if a suitable human player can't be found in due time. Maps are randomly picked from the current maps pool (which is regularly updated with brand new maps from time to time, ensuring the meta-game stays always fresh). The design of different maps has a huge impact on how matches are played: some maps are large and very expansive, while others don't allow for as much manoeuvrability, and LoS (how much abundant cover is) always is a huge concern. This makes for some fierce and very frantic action, as different players will use different strategies to achieve final victory. While some might simply not bother going for the kill, opting to making their best with keeping your own characters away from the Victory Squares, other employ all kind of tactics to just obliterate any opposition. The fact the maps in the pool present very different designs and features means you can't just use a deck which is specifically built to optimally perform on a specific map, as you will most likely have an hard time emerging victorious from the remaining maps in the pool. Contrary to SC2 and other RTS games, you can only change your build (your party and decks) in-between fights, so striking for balance and optimizing towards at least a few maps is an important aspect. The PvP in this game, let me tell you, is brilliant. The number of builds and strategies you can go for is astonishing and matches can be very exciting. Positioning in this game is paramount, and the way you move your guys on the board impacts the gameplay in more than a crucial way. At times you do get something along the like of a build win/loss, but in my experience that's a very rare occurrence, for (at least if you don't build your decks in a too narrowly-focused way) you usually have plenty of options with playing your cards in ways which are flexible enough for you to deal with lots of different opponent's strategies. The community is very welcoming too, and comprised of nice people for the most part. Tough competition is always fierce, you will only rarely meet bad-mannered fellas and a gg at the end of the match is almost always a given. Chatting with your opponent while a game is going on can make for very enjoyable moments. Being turn-based, you don't really get penalized too much for typing while playing, so that's something else nice about it. As you win MP games, your rank will go up accordingly, making you gain positions in the Rank Ladder. Most importantly, every win in a ranked match also nets you a chest worth of assorted loot. The reward system in MP is very different from the one in campaign. As soon as you win your first MP game, a timer starts counting down from 16 hours to 0. The more wins you manage to score before the timer runs out, the better loot you can get. In fact, while most chests are plain normal ones, some are worth more abundant, better loot. You get a golden chest (containing a varying number rare items or better) for your 1st, 3rd, 6th and 11th win. You can also get a purple, epic chest (containing a guaranteed epic item + more stuff) if you manage to win 20 games before the time resets itself. This adds to the sense of urgency to winning MP matches, as players who are doing an Epic Chest run will try to score as many wins in as little time as possible. Do keep in mind some of the longer matches can easily last 30 mins or more, though most will likely be 15 to 20 minutes long (unless your opponent is not slacking off taking his turns). Please keep in mind fretting your opponent, or otherwise being harsh on him for taking too long with playing the next move is generally considered very bad-mannered. That being said, politely asking your opponent if he is still in front of the monitor is fine though. I forgot to mention you can also create/join casual matches, though this are obviously unranked and won't award you any amount of rank points nor loot. Hi guys, I saw that Day9 used in the gand prix for his magic cards some card sleeves. Which ones did he use? And how are they or are better ones out there?